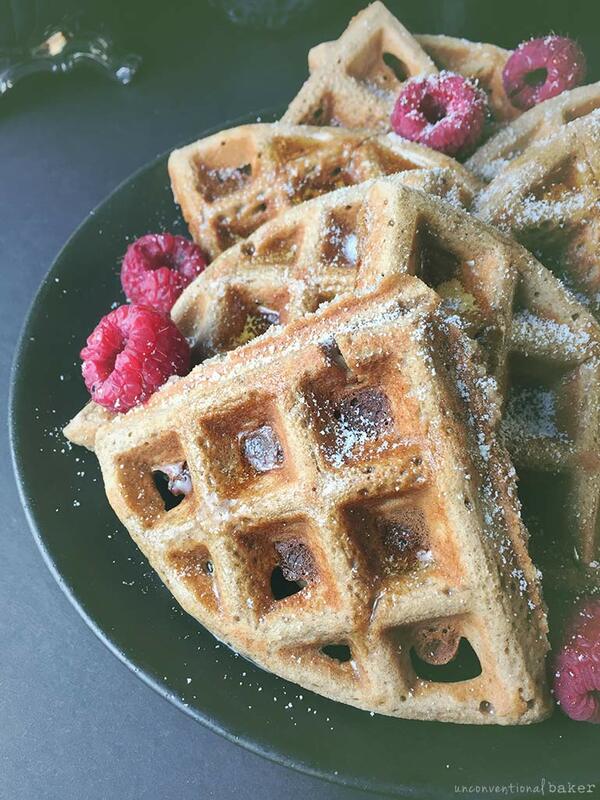 A few weeks ago I shared a recipe for my favorite waffles: these millet almond butter waffles, which seem to have been well-loved so far. I did, however, receive quite a number of inquiries about a buckwheat version. 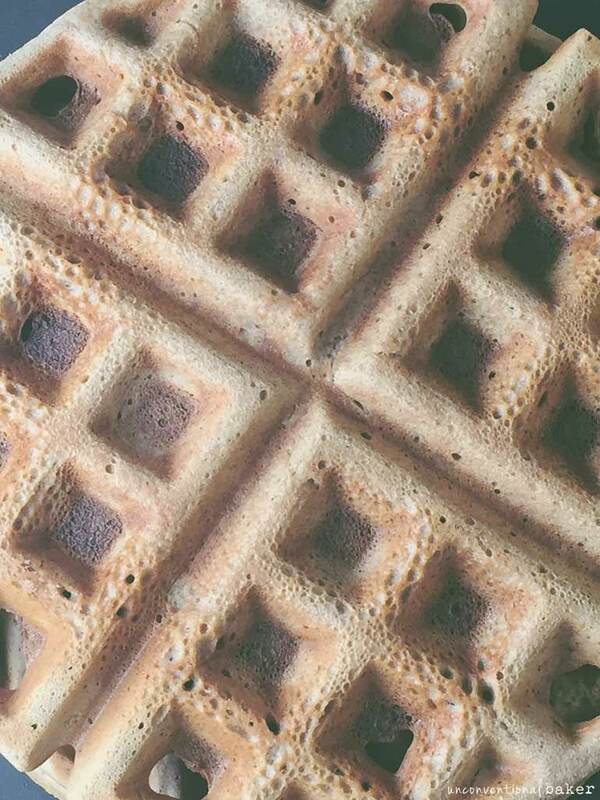 Incidentally, I already had a buckwheat version in my waffle-making repertoire — everyone has one of those, right? ;) — that’s quite similar to that other recipe. I alternate between these two depending on what flour I have on hand. 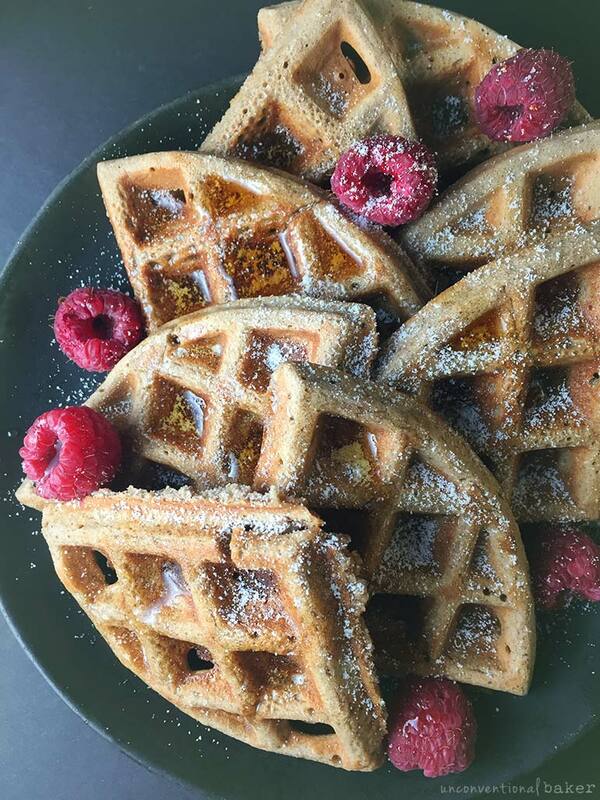 The funny thing is that even though the recipes are similar, the end result is quite different, which is why I thought it would be good to create a separate space for these fluffy buckwheat waffles. The millet version is personally hands down my favorite — they come out extremely crispy around the edges and I just love that. 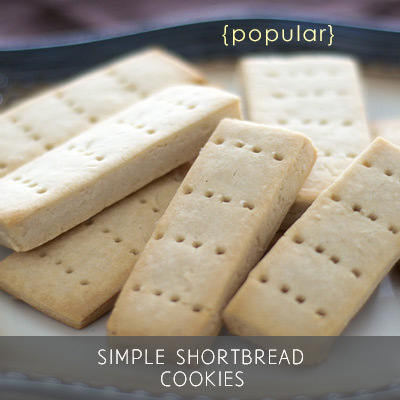 That level of crispness is extra surprising considering there’s no oil or butter in the recipe. This quality is certainly missing in this buckwheat version, but instead these waffles come out extra fluffy. So if you’re a fluffy waffle kind of a person, and like buckwheat and things not overly sweet, these will be your morning friend. The main difference in the recipe itself (besides the flour swap) is the quantity of liquid. Buckwheat flour seems to need more moisture for these to work, as otherwise the batter comes out a bit too thick. 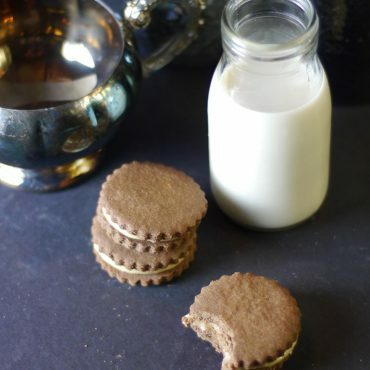 I’ve made these many times and tend to experiment with the amount of almond milk I add — the quantity I included here is the ratio I prefer the most, however you can also make this with ¾ cup almond milk instead of the full cup and the recipe still works (though you’ll get slightly smaller waffles). One last quick note before you dive in is just to keep in mind that different waffle makers are, yep, different. So the cooking time and the batch size might need to be adjusted accordingly. 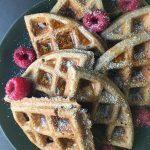 Fluffy soft waffles that are super simple to make and are gluten-free, vegan, and made with no added oils or refined sugars. powdered coconut milk for dusting**, maple syrup, raspberries or other fresh fruit or berries, ice cream, your favorite jam, etc. Preheat waffle maker to a medium-high setting (or to whatever your preferred setting is). Have an an oil spray standing by (if using). 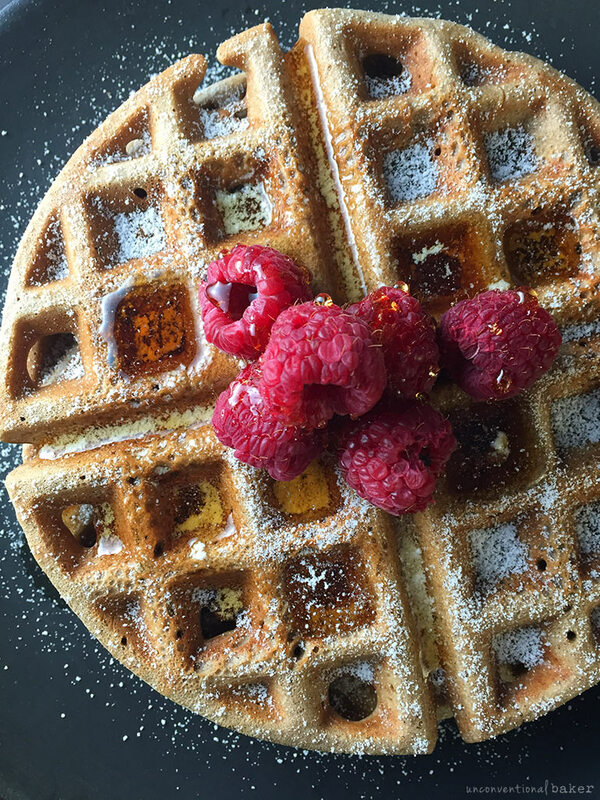 Place all waffle ingredients, except buckwheat flour, in a power blender and blend until completely smooth. Add the Flour and blend once again to combine. Pour a third of this mixture (or whatever amount is suited for your waffle maker size) into your pre-heated (and oiled if needed) waffle maker and bake for 7 minutes (until steam stops rising from the waffle maker). Carefully remove the waffle onto a plate with the help of silicone-tipped tongs (or something similar). Note: it will crisp up very slightly as it cools on the plate. Repeat with the remainder of the batter. Top with your favorite toppings and enjoy straight away. *If you have a good non-stick waffle maker, or if your waffle maker is already seasoned, then you can skip the oil. Otherwise a light spray coat does the trick nicely (I used this coconut oil spray). **For the coconut milk powder, if using, be careful that the brand you purchase is actually dairy-free because some can contain dairy in addition to coconut. I linked in the ingredients list a brand that’s vegan so you can see an example of what to look for. 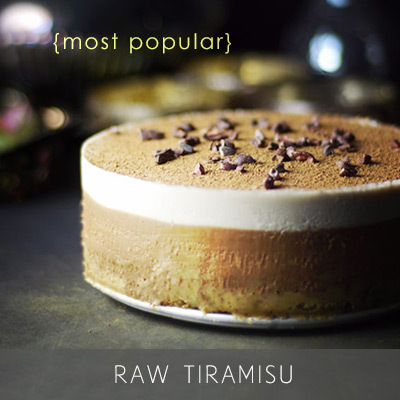 Disclaimer: this recipe contains affiliate links to the powdered coconut milk, coconut oil spray, and tongs recommended for it. 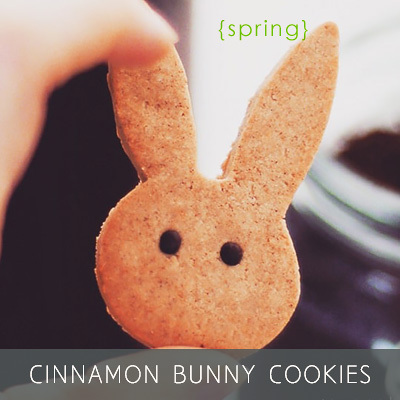 I just made them for my 7 months old baby, it’s a great finger food! I am lucky, he has no allergy…I can even put peanut butter on the waffles ;) Banana was the first fruit I gave him, and buckwheat was the first ”cereal”, so he loves them both. I really love buckwheat (since I’m a baby too). It’s a local crop in Quebec and it’s easy to find organic flour or raw groats. I use the groats in some raw recipes instead of nuts, since it’s crunchy. just wondering if you know how many calories are in these or any other nutritional info which would be much appreciated! Hi Mona, you can use sunflower seed butter instead of the almond butter. Alternatively you can use 4 tbsp dairy-free butter — I haven’t tried it out, but I think it should work well here. Me, the sweetener obsessive again. Looks great. For serious health reasons, I have to keep sugars to a minimum so bananas are out for me, so I’ll forward to a banana-free version. Also, what do you think about monkfruit as a sugar alternative? I’m curious about it because it would appear that it contains no glucose and also has other health benefits as was used medicinally in China for centuries. I haven’t had much experience baking with monkfruit as it’s generally not easily available where I am (and the versions that are available of it online here are usually largely erythrytol-based instead). I have tried some chocolates made with it while traveling before though and they were pretty tasty — so I see its potential. Just not sure how it fully functions in baking in different ways. 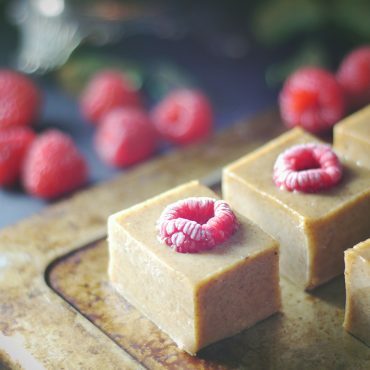 But I can see it working well in some recipes, like here instead of lucuma powder for example: https://www.unconventionalbaker.com/recipes/cashew-lucuma-fudge/ . If I ever find a good accessible source for it around here I’d be happy to play around with it. 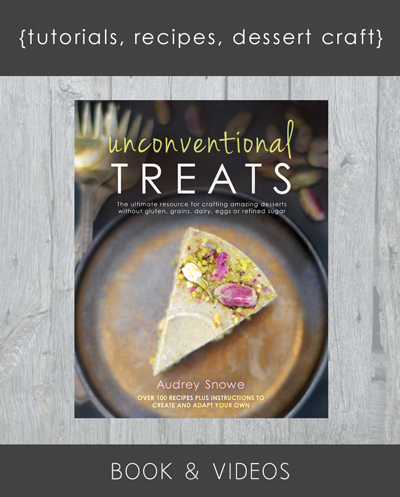 Hi Audrey…I would love, love, love to start making waffles, this recipe works in every ingredient but the banana! My daughter is allergic! :( (and she can’t have millet!!) Can’t wait for the next version. Also, please can you post a bit on the type of waffle maker you use? I’m worried about the issues with non-stick coatings that seem to come with all modern waffle makers. Huge thanks for all you do. About the waffle maker, sadly I don’t have any exciting news on that front. I hear you about the coating issue. I got gifted my waffle maker a few months ago — it’s the cheapest kind you can get from Oster, but with the ceramic coating. It’s serving its basic purpose well, but I’m not sure how to feel about these ceramic coatings and whether they are truly a better option… The other alternative out there I’ve seen recommended is cast iron, but that requires more maintenance and heavier oiling.